Possibly "The Road To Ruin" from 1934? One of them has the lead from ROBOCOP in it. I didn't know there was an early talkie version of NAKED LUNCH. I'm sorry you are. . .
Well...the guy squatting is Micheal Conrad...perchance SCREAM,BLACULA,SCREAM??? Looks more like "Dirty Money" or "Un flic". That IS Richard Crenna, right? RC, it's not "Scream, Blacula Scream" I'm afraid. I'll post a fun and fairly easy one later. I'm worn out. Nap time. Funny - when I Google "William Devane Beatnik" I got a picture of President James Buchanan, recently voted Worst President Ever. I smell a conspiracy! William Devane shot Lincoln! If that's not William Devane . . . never mind. 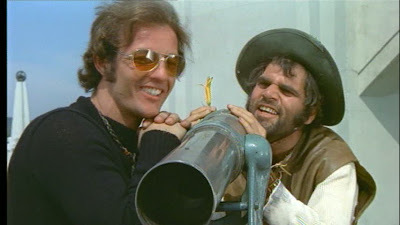 Though I have never seen the film...I'm thinkin' The WILD RIDERS...cuz the one guy looks like Alex Rocco! Cripes! Now I gotta see it!!! Looks like as much fun as SATAN'S SADISTS!!!! ( I like cheezy biker movies)! RCMerchant...COME ON DOWN!! You are the next contestant on "Name That Movie - Pictures"
It is indeed Alex Rocco, mad dog biker who just wants to be loved. 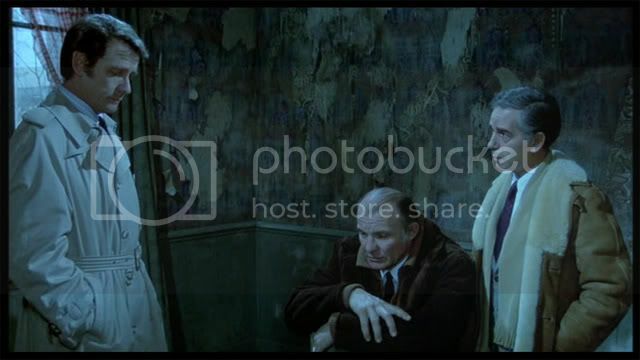 Next to him is Arell Blanton, the blackmailer from my all-time, hands-down, most favorite film, "Blood Mania"!!!!!!!!!! And, RC, I'd recommend buying Drive-In Cult Classics Vol. 4. You get this and 7 other whacked-out films for only $9.99 at Best Buy. Deep Discount may have it at a similar price. I'm so happy I got one right !I may ejaculate!!!! And I defintly will look that colection up!!! THANKS !